Kimosi, our young female okapi, is settling into her new life at a zoo in France. Kimosi left Wild Place Project last week to be paired with a male okapi at Zoo du Bassin d’Arcachon, near Bordeaux. The move highlights the importance of cooperative working between zoos in order to further the captive breeding programmes for rare and endangered species. 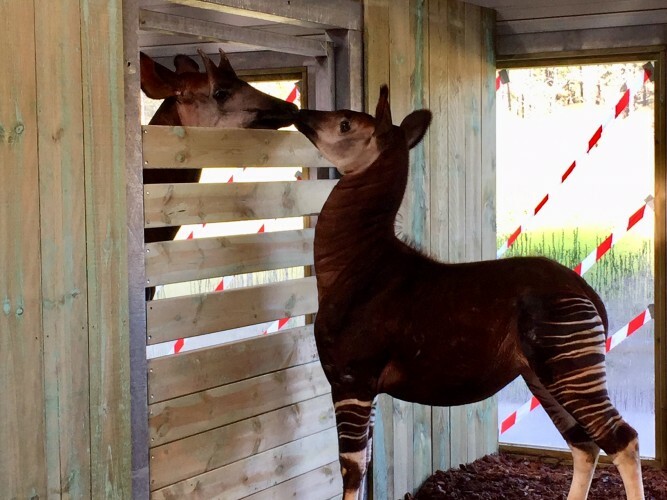 There are four okapi remaining at Wild Place Project – Lodja, Kivu, Ruby and Kibibi – and we hope they will breed again in future. There are only 13 okapis in the UK and Wild Place Project has been recommended to continue its successful breeding programme for the species, which is classed as Endangered. There were just 13 okapi births in Europe over the past two years and two of these were at Wild Place Project.